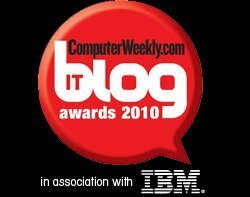 IT Blog Awards 2009: IT Twitter User of the Year - category information. This year, we are introducing an award for the IT Twitter user of the year. If you have found yourself following every word of someone’s feed for industry tips, submit their @ name as your nomination for this category. Get your badge now. quality="high" bgcolor="#ffffff" width="120" height="220" name="cw_badge10_tweeter" align="middle"
Blogs and Twitter accounts do not need to originate in the UK, but they must contain some coverage of the UK IT industry. The only exception to this rule is the Best international category.